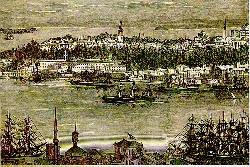 When Sultan Mehmet the Conqueror took Istanbul in 1453, he first ordered the construction of a new palace for this new Ottoman capital, on a site in the district of Beyazit where Istanbul University stands today. But before long, he changed his mind and had a number of buildings constructed on the headland to the southeast. This was to become the palace later known as Topkapi. Apart from brief intervals, Topkapi Palace was home to all the Ottoman sultans until the reign of Abdulmecid I (1839-1860), a period of nearly four centuries. Over the years the palace complex underwent constant evolution. Some buildings disappeared, destroyed by fire, earthquakes or demolished to make way for new buildings. The palace was therefore not a single massive building in the western tradition, constructed at one go, but an organic structure which was never static, and reflected the styles and tastes of many periods in many independent units with individual functions. The last new building to be added to Topkapi was commissioned by Sultan Abdulmecid who abandoned Topkapi for a new palace on the Bosphorus. Neglected thereafter, Topkapi Palace fell into disrepair. After the establishment of the Republic in 1923 it was extensively renovated and transformed into a museum, and ever since has been one of Istanbul's most popular sights. Since Topkapi is so large, only some sections are open to the public. Before entering the outer portal of the palace, let us pause to look at the fountain of Sultan Ahmet III just outside. This lovely baroque building dates from the 18th century and is the most striking example of such "meydan" fountains. On each of the four sides of the fountains is a tap, and at each of the four corners a "sebil" for the distribution of drinking water to passersby. The road leading off to the right here takes you to Ishak Pasa Mosqe which has lost much of its character in repairs carried out over the years. This portal flanked by towers known as the Bab-i H’mayun was built in the time of the conqueror. As at the Orta Kapi or Central Gate, the severed heads of traitors were occasionally displayed here. The portal was guarded by a special regiment of guards. Around the first courtyard within this gate were numerous service buildings, including a hospital, bakery, mint, armoury and accommodation for palace servants. This courtyard was open to the public. To the right as you enter the portal are the remains of the Byzantine Samson Hospital, which was razed during the Nika Rebellion. This hospital was famous in its day, providing treatment for rich and poor alike. Next to these is Haghia Eirene, one of the oldest churches in Constantinople and the church of the patriarchate prior to Haghia Sophia. It was enlarged in the early 4th century, and at that period played a major -and sometimes bloody- role in the controversies between Arian and Orthodox Christians. The church, too, was burned down in the Nika Rebellion and rebuilt by Justinian. Haghia Eirene is the only Byzantine church in Istanbul with its atrium intact. The plan is a good example of the transition from a basilica to a Greek cross. Thick walls support the main dome and the small dome to the east, while columns divide the nave from the aisles. The plain cross in the apse must date from the iconoclastic period and the remains of the mosaics in the narthex probably date from the time of Justinian. Since Haghia Eirene was enclosed by the palace walls soon after the conquest, it was never used as a mosque. Instead the janissaries of the palace used it as an armoury. The accumulation of antique weapons which resulted led to the building being used as the first Turkish military museum in the 19th century. When the military museum moved to new premises in Harbiye, Haghia Eirene was restored and for some years now has been used as a concert hall, a function for which its excellent acoustics and evocative atmosphere are ideally suited. A narrow lane leading down the hill from the church takes you to G’lhane Park which was once part of the palace gardens. Halfway down the hills is the Tiled Pavilion and the Archaeological Museum, possessing one of the most outstanding collections in the world. Next door is the Museum of Near Eastern History where fascinating pre-Islamic Arab works and finds from Assyria, Babylon and Egypt are exhibited. 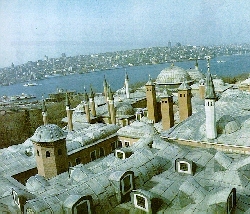 The Tiled Pavilion is the earliest building of Topkapi Palace, built by Mehmet II (the Conqueror). The striking tiles which adorn the entire building still display strong traces of Seljuk Turkish art in both the designs and the predominance of blue and turquoise. It is for this reason that the building has been transformed into a ceramics museum, where the finest examples of Turkish ceramics from the 12th century to the present day are on display. At the entrance to G’lhane Park is the Alay K÷sk’ (meaning Ceremonial Pavilion) dating from the reign of Mahmud II (1808-1839) who watched various parades and processions from this vantage point. If we enter G’lhane Park and walk straight ahead, we came to the Gothic Column, which was one of the principal Byzantine monuments, and thought to have been erected in commemoration of a victory against the Goths at the end of the third century. Nearby are the ruins of an unidentified Byzantine building. There are known to be several Byzantine cisterns in the palace courtyards and next to the Archaeological Museum, and excavations here might also reveal the remains of the old acropolis. Before entering Topkapi Palace proper, there is one more building of note. This is Sepetciler K÷sk’ (meaning pavilion of the Basket Weavers) (who wove baskets for produce from the imperial gardens) which is the last survivor of a number of palace pavilions in this area. This building at the water's edge now houses the International Press Centre. An extra charge is made for visiting the Harem at Topkapi Palace, and groups of limited numbers are only allowed in at specific intervals, so it is best to get your ticket for the Harem as soon as you arrive. These restrictions are necessary to prevent any damage being done to the contents of this section. The Harem is a vast labyrinth of rooms and corridors, and only part is open to the public. The visitor's entrance is via the Divan Odasi in the second courtyard. 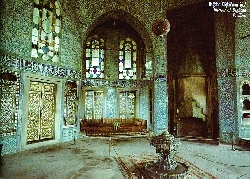 The Divan Odasi or Chamber of State, served as a transition between the Harem and the public apartments of the palace. The Council of State convened four days a week under the Grand Vizier, over whose seat was a window with an iron grill. Whenever he wished the sultan could observe the meetings without being seen. 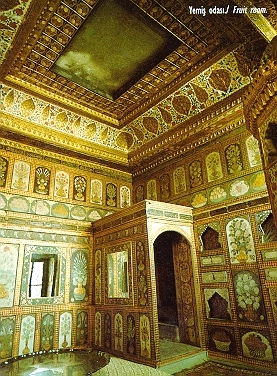 The Inner Treasury Chamber adjoining the Divan houses a collection of weapons. Now we enter the Harem itself, where we can see rooms occupied by the black eunuchs, concubines, the sultan's mother and the sultan himself. The most fascinating aspect of the Harem was the cloak of secrecy over life here. Virtually none of its inhabitants had the freedom to go out at will, and equally almost no one from the outside world was ever admitted. Sexuality is the principal theme on which the architecture is based, the sultan and his concubines and consort. Between these two poles of a single man and many women, were the sexless eunuchs who were guardians of the concubines, but themselves virtual prisoners. Of course the young princes lived in part of the Harem, and after puberty they too were provided with concubines. But their public existence was confined to the shadowy one of "potential sultans". 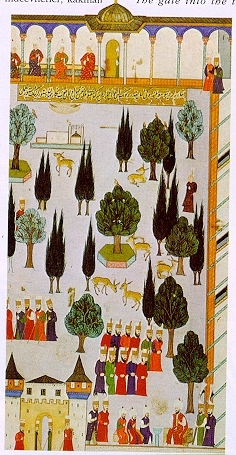 Despite the change in the laws of succession introduced by Ahmed I, according to which the eldest member of the dynasty rather than the eldest son of the reigning sultan succeeded to the throne, the princes lived in constant fear of assassination. The central gate known as Orta Kapi or Babusselam is the main entrance to the museum. Executions used to be carried out on the inner side of this gate and the heads exhibited on blocks of stones to the right of the door. Along the opposite side of this courtyard are the kitchen buildings, which provided food for literally thousands of people every day. The lines of small domes and chimneys surmounting them make the kitchens a familiar part of the palace's silhouette. The central gate known as Orta Kapi or Babusselam is the main entrance to the museum. Executions used to be carried out on the inner side of this gate and the heads exhibited on blocks of stones to the right of the door. Today as well as some of the original kitchen equipment, the palace's enormous collection of porcelain and glass is housed here. The Chinese porcelains are what is said to be the largest collection in the world. Following the courtyard wall to the left brings you to the stables which housed only the sultan's own horses. Various exhibitions are held here. The gate into the third courtyard known as Babussade or Gate of Felicity brings us into the private inner areas of the palace. Only the sultan was permitted to pass through the gate on horseback, and even on foot only a favoured handful of statesmen and trusted intimates could enter here. Only once in Ottoman history, during the rebellion which dethroned Osman II, did rebels dare to enter this gate. And on one occasion Alemdar Mustafa Pasa broke this door down in order to save the life of Mahmut II. Ceremonies such as those held on a new sultan's accession were held in front of this gate, and it was here when the janissaries were simmering into rebellion that councils were held to discuss their demands. It was also in front of this gate that the sultan presented the army commander with the holy standard when he set out on campain. 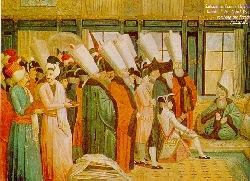 Within the gates is the Audience Chamber, where the Grand Vezier and members of the Divan came to present their resolutions to the sultan for ratification. It was also here that foreign ambassadors were received. Right behind the Audience Chamber is the elegant library built by Ahmed III in the early 18th century. The buildings in the southeast corner of this courtyard housed the Imperial Enderun, an institution where young boys taken as tribute from Christian families in the empire were trained for administrative posts in various state departments. Some of these rooms now house offices and others the costumes section. Beyond these is the famed Treasury where jewelled thrones, baskets of emeralds, inlaid daggers and other valuable objects are exhibited. One of the buildings opposite the third gate houses an exhibition of the finest miniatures in the museum's collection of over ten thousand. The Has Oda, where the most able of the young Enderun novices were educated, now contains a superb collection of calligraphy. Passing through to the fourth courtyard beside the wing containing the miniatures brings us to a series of exquisite pavilions built by various sultans. 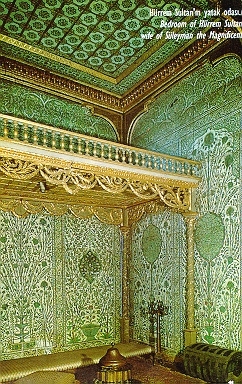 The Bagdat and Revan Pavilions built for Murat IV are outstanding both in terms of their architecture and interior decoration. 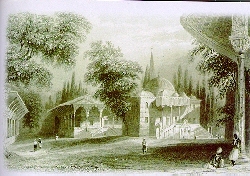 The Sofa Pavilion in the center was built in the tulip gardens laid out during the reign of Ahmet III. 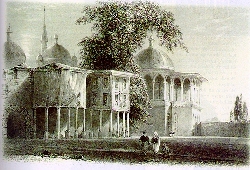 The pavilion of Sultan Abdulmecit on the right is now used as a restaurant. Between the Bagdat and Revan pavilions is a marble terrace with a pool in the centre and an arbour with a gilded baldachin roof commanding a view over the Golden Horn and the Bosphorus. 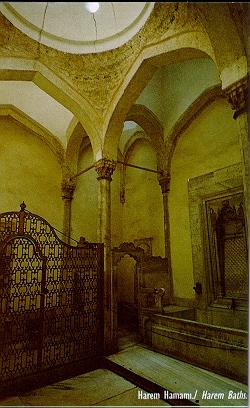 The Apartment of the Holy Mantle opposite is the section where the holy relics brought back from Mecca by Selim I on his return from the Egyptian campaign are kept. Beside the western terrace is the Circumsision Chamber built by Sultan Ibrahim. Topkapi Palace nowhere aspires to imposing height. Everywhere the axes are horizontal, and the style consciously humble, avoiding ostentatious monumental facades. 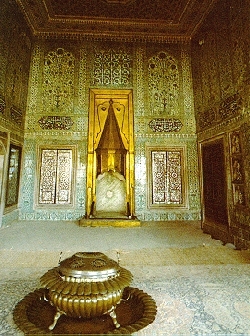 While mosques, as the house of God, were deliberately built on a large scale wherever possible, the sultans did not seek similar grandeur for their own homes. That is why, if it were not for the intricate decoration of surfaces and monumental gates, Topkapi Palace could disappoint the visitor in search of the same definition of splendour as exhibited by European palaces.